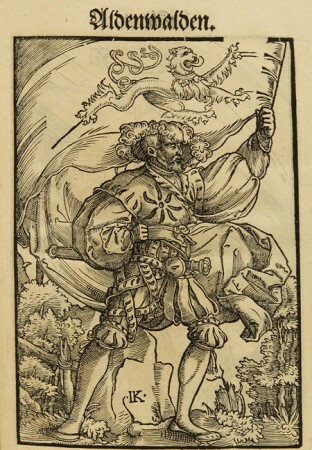 A nice old drawing of a typical Lansquenet standard bearer. 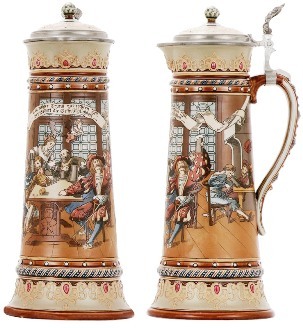 These and the other like prints would be great as a backdrop against steins with these guys on them I would think. 1. 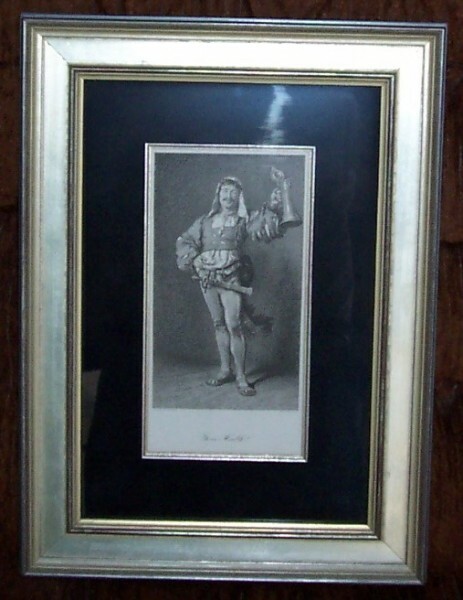 A German foot soldier in foreign service in the 15th and 16th centuries; a soldier of fortune; — a term used in France and Western Europe. 2. A game at cards, vulgarly called lambskinnet. 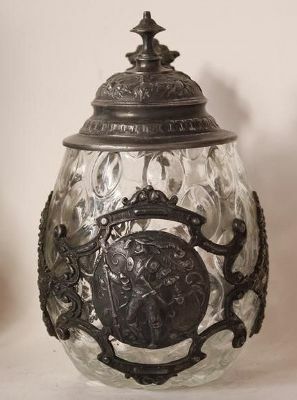 .5 liter blown clear glass stein. 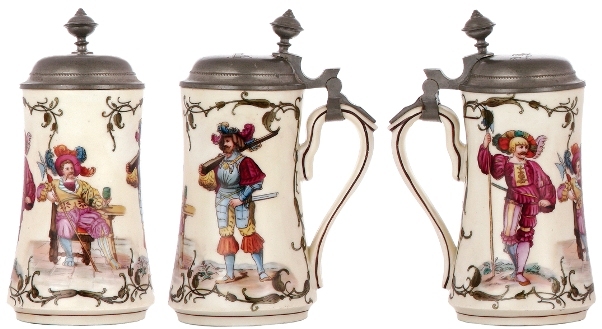 Circa 1880-90. 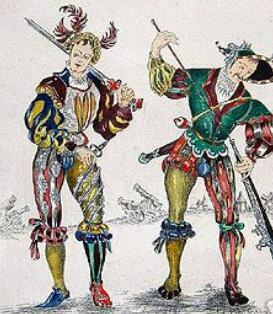 LANDSKNECHT: A German mercenary foot-soldier of the i6th century. 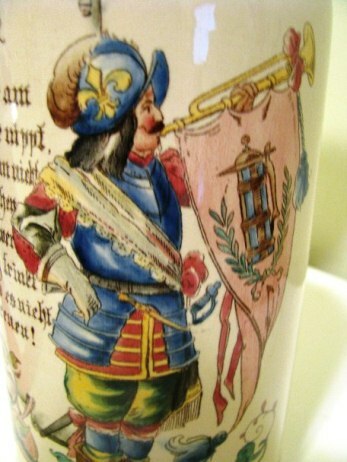 The name (German for “a man of the plains”) was given to mark the contrast between the force of these soldiers, formed by von Frundsberg at rthe request of the emperor Maximilian I, about the end of the 15th century, and also the Swiss, “the men of the mountains”, at that time the typical mercenary infantry of Europe. 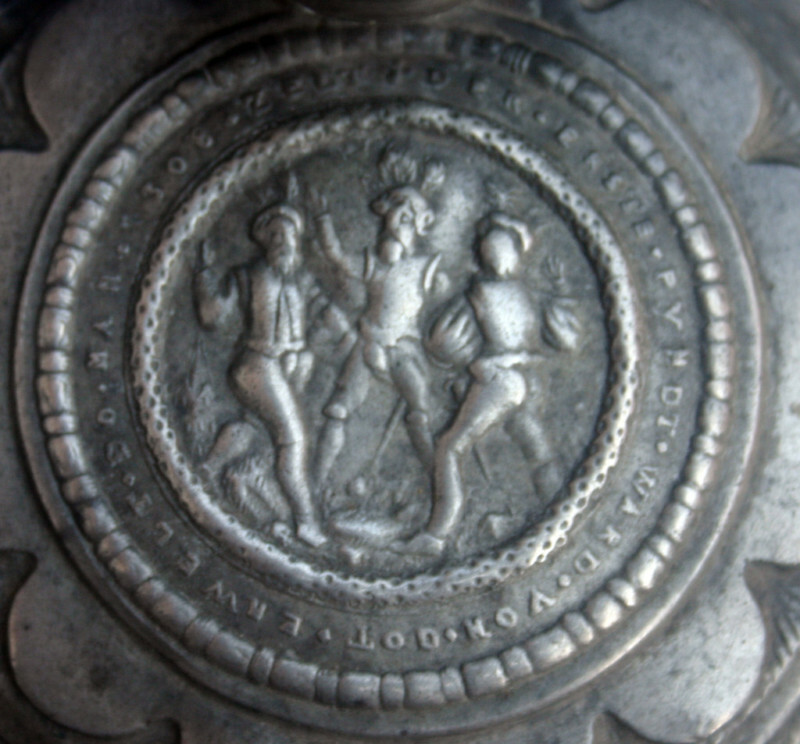 After the battles of Marignan and Pavia, where the military reputation of the Swiss had been broken, the Swabian landsknechte came to be considered the best fighting troops in Europe. —n. 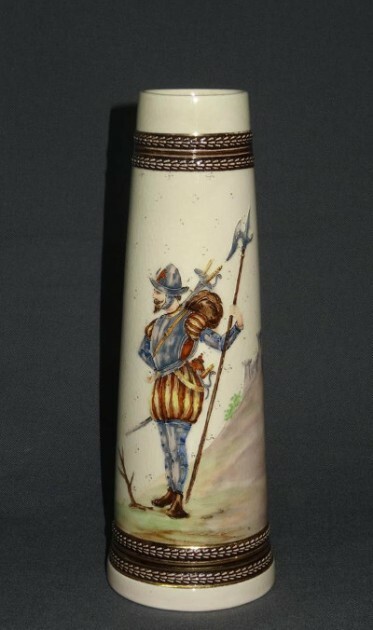 a European mercenary foot soldier of the 16th century, armed with a pike or halberd. 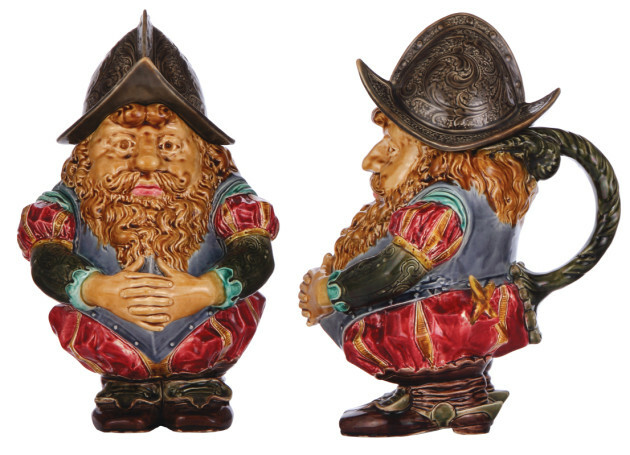 Also, lansquenet. 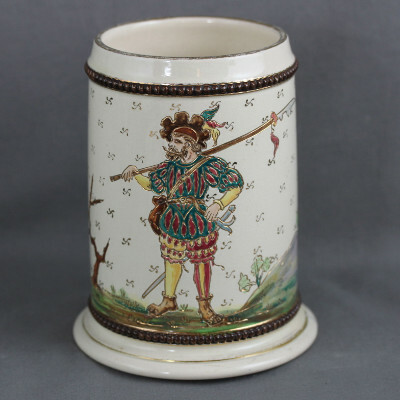 One liter hand painted relief majolica stein. 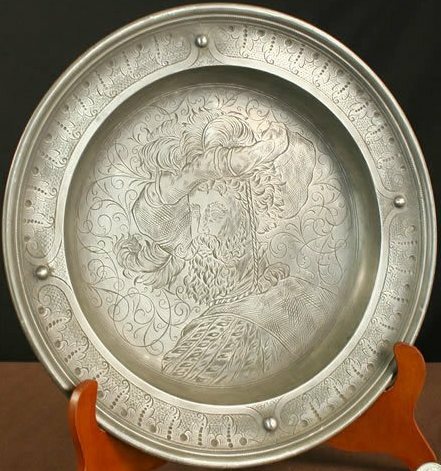 Unknown maker. Austrian probably. Circa 1860-70 [FWTD]. Very well done and super scarce. 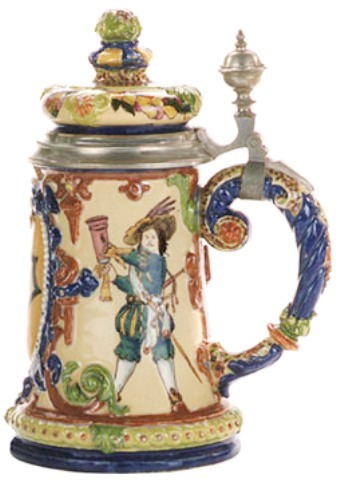 Though primarily a German force and always the mainstay of imperial armies, they served in organized bodies as mercenaries elsewhere in Europe; in France they fought for the League and for the Protestants indiscriminately. 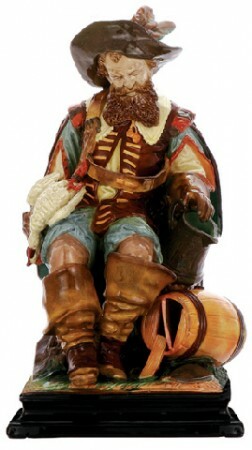 In fact iandsknecht, and more particularly its French corruption lansquenet, became in western Europe a general term for mercenary foot-soldiers. 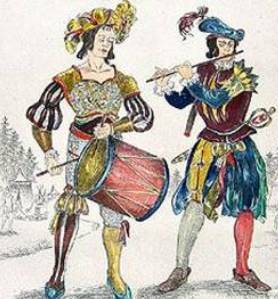 It is owing to the lange Spiesse (long pike or lance), the typical weapon with which they were armed, that the corrupted French form, as well as a German form, Lanzknecht, and an English Lanceknight came into use. 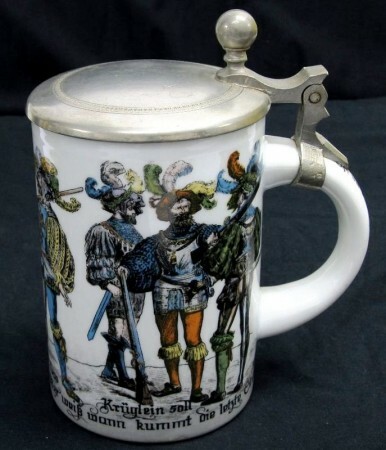 The landsknechts were raised by colonels (Oberst), to whom the emperor issued recruiting commissions corresponding to the English indents; they were organized in regiments made up of a colonel, lieut.-colonel and regimental staff, with a varying number of companies, colors (Fahnlein), commanded by rapt ains (Hauptmann); subaltern officers were lieutenants and ensigns (Fadhnrich). 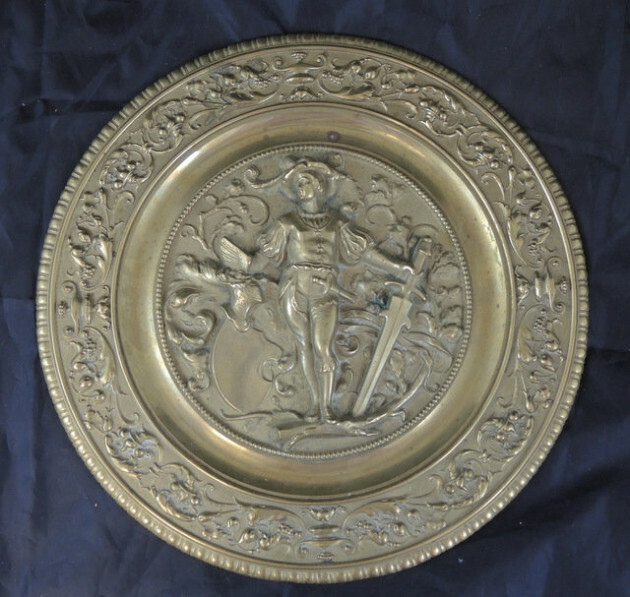 In thus defining the titles and duties of each rank, and in almost every detail of regimental customs and organization, discipline and interior economy, the landsknechts may be considered as the founders of the modern military system on a regimental basis. 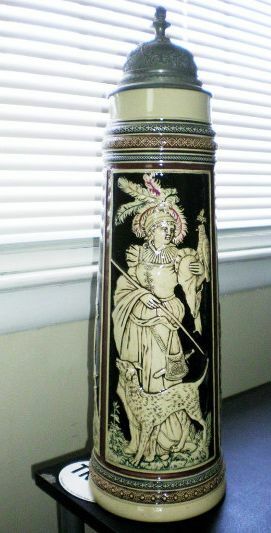 A Lansquenet flag bearer, as a side scene on a Bohemian chased and stippled copper stein. 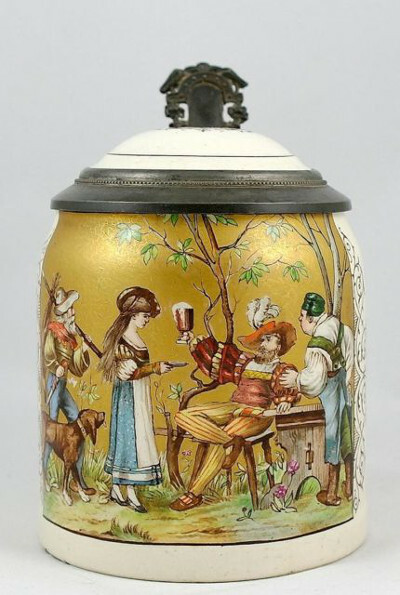 Circa first part of the 19th Century. 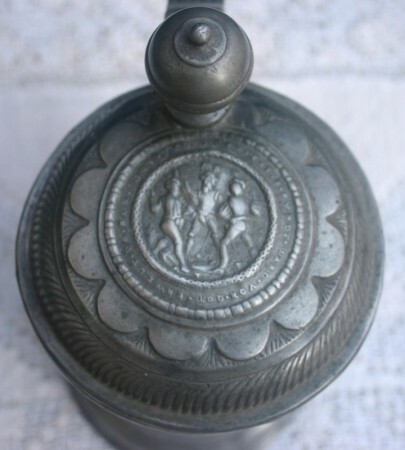 Kind of a messed up pewter body (cleanable, but lots of work), but a neat relief scene on the lid. 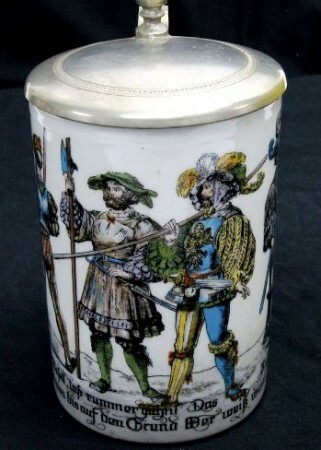 Enameled medieval “Lansquenets” on a large Josephinenhutte, or Theresienthal glass server. 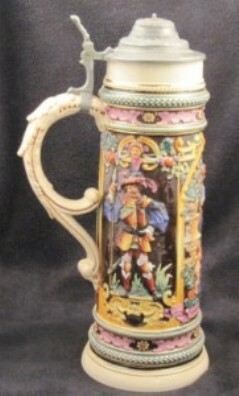 Another of the same vintage and style. 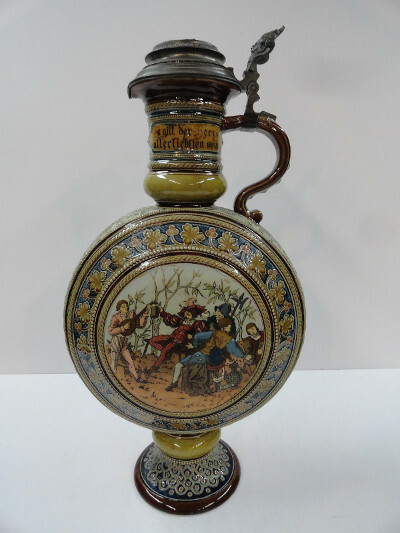 A very well done porcelain half liter Ca. 1890. 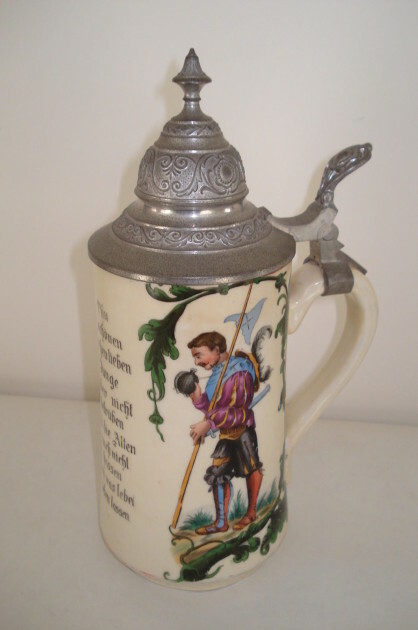 A “standart” bearer, .5 liter stoneware, POG, Circa 1910 -20. 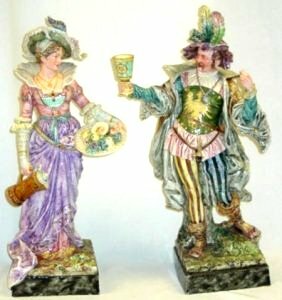 A German majolica statuette showing a empty wooden [?] 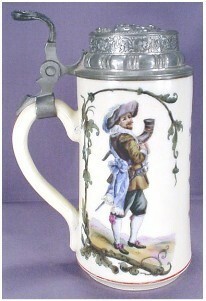 tankard by his side. 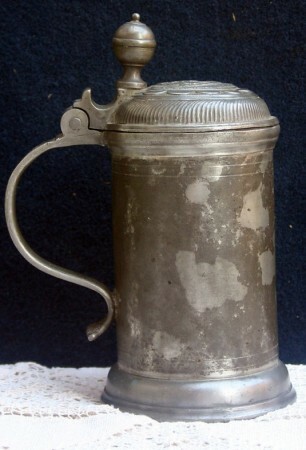 Unknown maker and size. 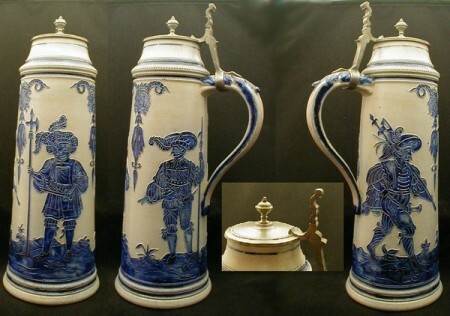 Above: On two V & B Mettlach, incised .5 liter steins. And on V & B Mettlach No. 1859. 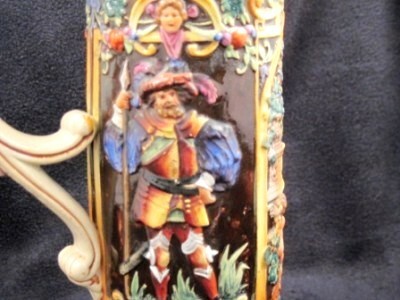 Really great detail on a 1 liter Westwerwald stoneware stein. 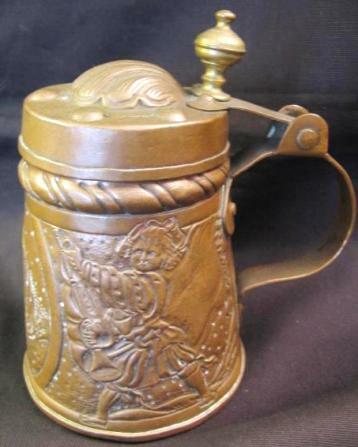 I wish I could find a pokal such as that one shown. Got one? 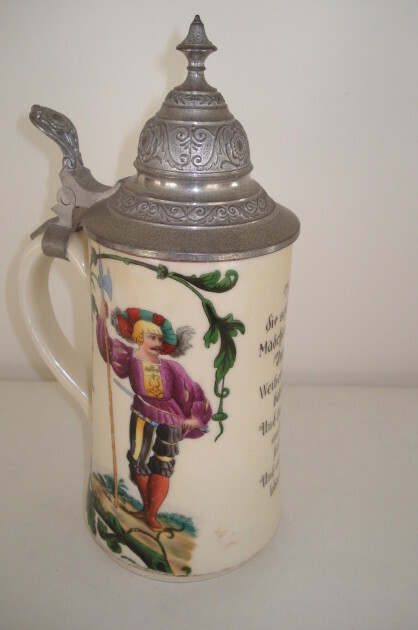 .5 liter, porcelain, unknown maker, possibly Austrian. Ca. 1890. 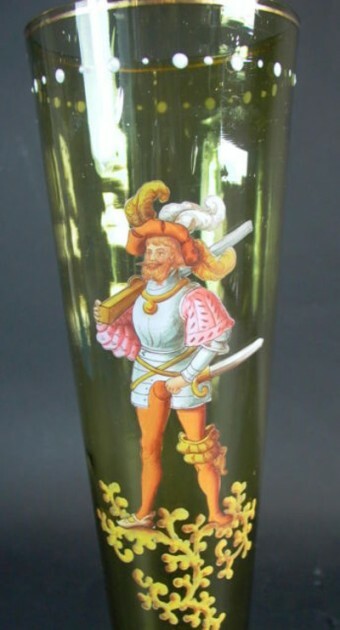 No split or multi- colored pants, but still one of the boys, just enjoying his wine in an old glass roemer. 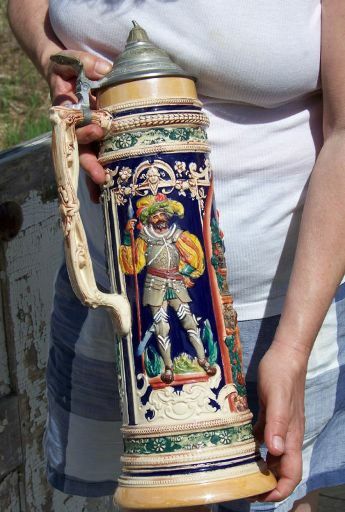 On a .5 liter pottery PUG stein. Ca. 1900. Lansquenet on Gerz stein. No. 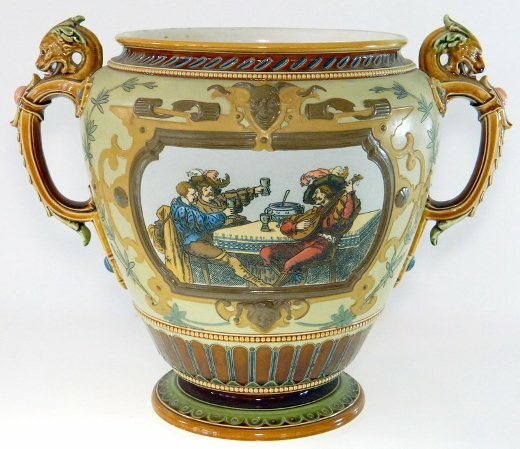 866; a 2 liter relief pottery. Ca1890. 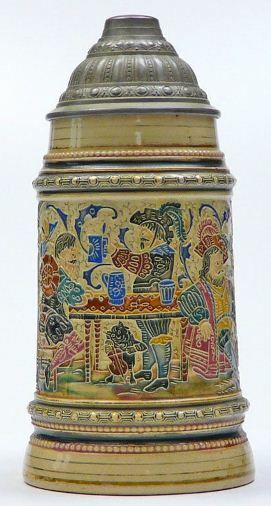 [L] Side panel of Gerz No 866, the salt-glazed stoneware stein version.-[R] Front panel of same. 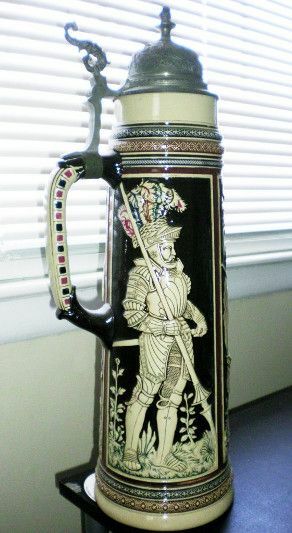 A colored version on a 18 inch stein by Gerz. 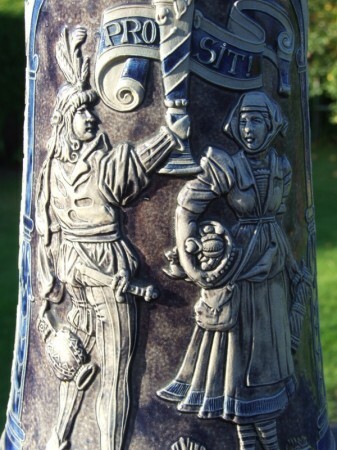 An enameled flute – 12 inches tall. Lansquenet with a halberd. 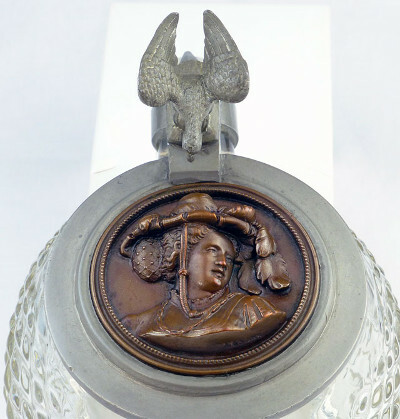 Probably Josephinenhütte. Circa 1880. 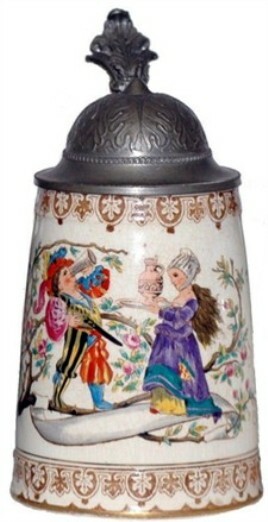 Another enameled flute, Circa 1900 Unknown maker, perhaps Theresienthal Glas Hutte. 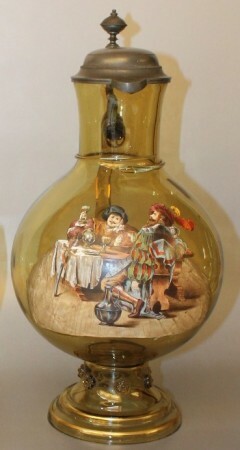 Two “card playing” clear blown enameled glass beakers by Theresienthal. Ca. 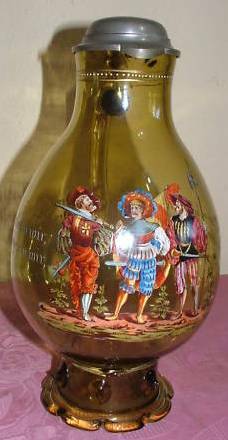 1900.
. .5 liter blown glass stein. Ca 1890. 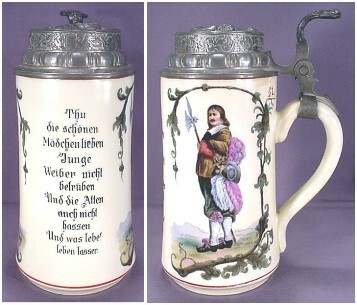 Another well done Theresienthal item. 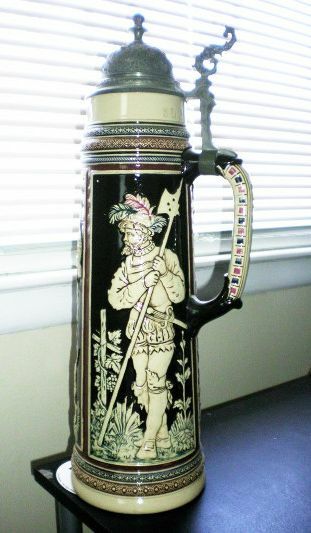 On a 1/2 liter, ‘newer’ porcelain stein by Kaiser. 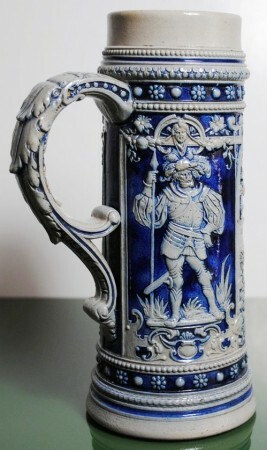 I think I can help you here, since I am not only a German, but also a specialist on antique arms and armour. 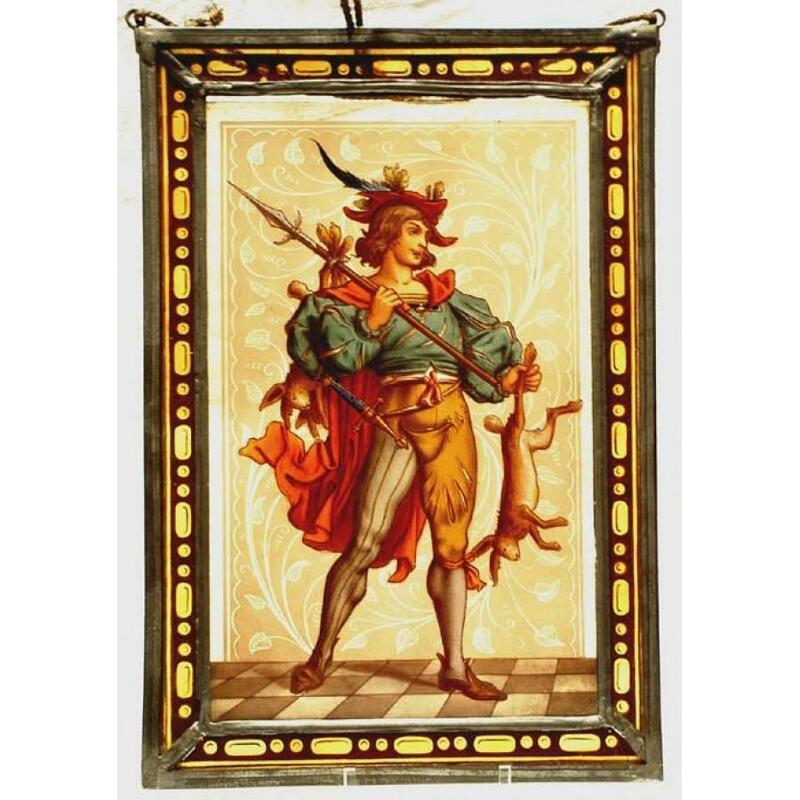 The figure shown is the 19th century romantic idea of a German landsknecht. 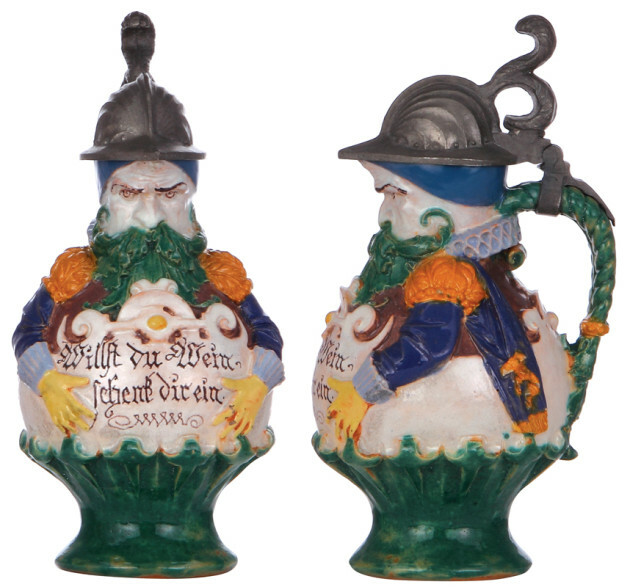 Those Morion-type helmets with the lily on the sides are very common in Germany. The lilies are not seen as heraldic symbols but rather as simple decoration. You do not find them in France at all, since the French had a different relation to the heraldic lily. The paragraph 12 refers to a set of drinking rules that were quite common at this time, especially with student fraternities. 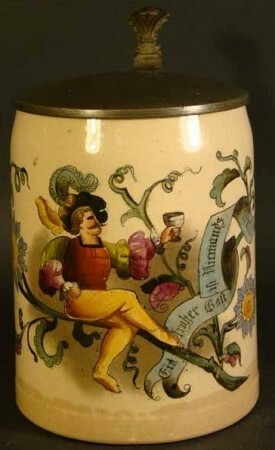 So it has nothing to do with France or Charlemagne, it is very typical and purely German.